While rice has been a Thai culinary staple for thousands of years, only recently has it been used as a beauty secret. Enriched with Vitamin E, it moisturizes skin while the ground jasmine rice sloughs away dead skin, leaving skin soft and smooth. Enjoy the light scent of jasmine as you unwind. This sophisticated soap gets its mystical color from bamboo charcoal powder, which sloughs away dead skin cells and absorbs odors. The cool citrus mint scent freshens your mind as well as your tired muscles. Perfect for active people looking for a fresh & clean scent after exercise. 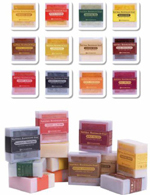 Exotic Cinnamon soap brings to you an ancient aromatic scent that helps relax and refresh your mind. Bask in the sweet, soothing scent of cinnamon while delicately exfoliating for softer, smoother skin. Turmeric, an ancient beauty secret, has been smoothing and brightening the skin of Thai women for many years. The addition of natural honey helps moisturize skin while cleansing. This signature Thai herb has long been used in a variety of well known culinary dishes. With its refreshing and zesty scent, it helps clear the mind and soothe the soul. Experience the ambience of the Orient while bathing with this all natural soap. White champaka is a sophisticated Thai flower known for its heavenly sweet scent. It brings peace and serenity after a stressful day. Let this soap take your thoughts to a flowering field in paradise. The orchid, with its elegant and charming blossoms, is the national flower of Thailand. The lovely feminine scent helps relax your mind and body after a long, stressful day. Oriental tea is known for its antioxidant and anti-aging properties. The ground tea leaves soften skin by exfoliating, leaving a fresh, clean scent that helps deliver you to a state of serenity. 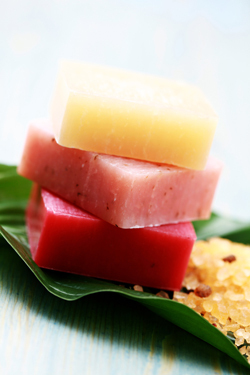 This signature soap emulates a renowned Thai dessert, mango and sticky rice. The fresh sweet scent of mango and jasmine rice will help you to be equally as irresistible after showering. Our natural Cherry Almond Soap has a delightfully inviting scent, perfect for an evening of romance. The almond powder gently scrubs away dead cells for smooth and soft skin. A perfect bath time treat for chocolate lovers! The cocoa oil helps soften skin while the deliciously sweet scent helps calm your senses before bed time. Indulge yourself! The lovely fresh citrus scent of Peach Passion Soap makes bath time a sweet indulgence. Bathe your skin with this luscious fragrance in the morning or at night.